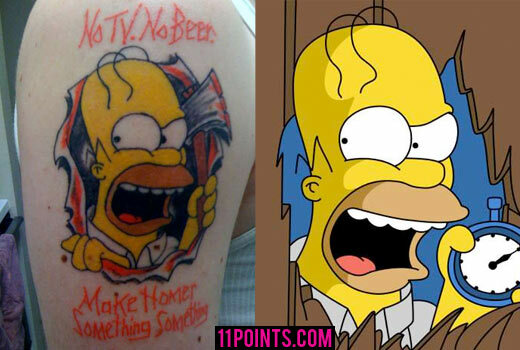 There are lots of people out there who’ve gotten brilliant Simpsons references as tattoos. In the pilot episode of The Simpsons, Bart decides to get a tattoo on his arm that says “Mother” inside of a heart. But Marge busts him in the middle of it, leaving it only saying “Moth”… and leaving the family in a position where they have to use their Christmas present money on tattoo removal. That episode aired in December of 1989, more than 20 years ago. In two decades, the world’s going to change; and, fittingly enough, one way it’s changed is in its attitude toward tattoos. While a 10-year-old getting a tattoo is something society’s still not on board with, tattoos themselves have become so ubiquitous that they’re really not looked at as a big deal any more. And, because of the proliferation of tattoos, people are willing to get less and less important stuff permanently marked on their bodies. 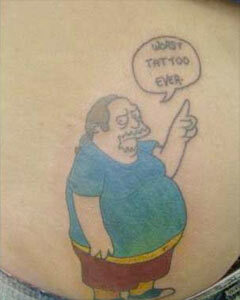 To bring this all full circle — that wholeheartedly includes tattoos of The Simpsons. 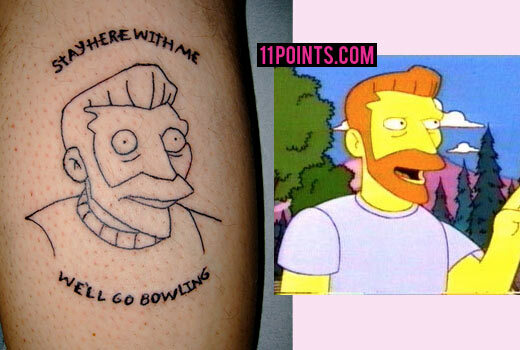 I dug through hundreds of photos of Simpsons tattoos to find 11 of the cleverest homages to the show. These tattoos are good enough that, 60 years from now, when the tattoos are encased in wrinkles, liver spots and hardened varicose veins, perhaps their bearers won’t be mortified to explain them to their grandchildren. 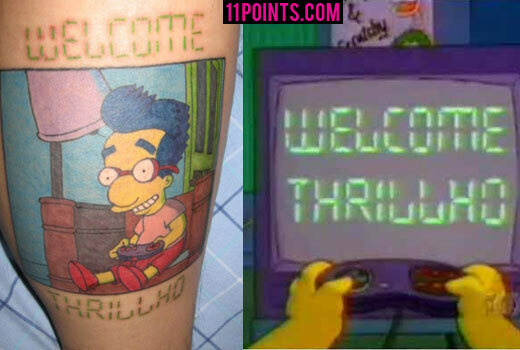 Getting a giant chest tattoo would almost certainly grow to be a regrettable decision… but this Sideshow Bob-inspired one is such a great Simpsons reference that this guy probably gets a laugh every single time he looks down on it. 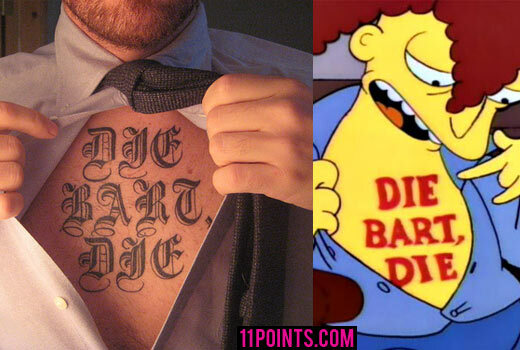 Sure, the tattoo might offend a stranger on the beach, but if he just gets a chance to explain that it’s German for “The Bart The” the person will realize there’s no chance he’s evil. You have to admire this older guy reaching out to the official beer of The Simpsons to bring him the six pack that, coincidentally, beer has eternally denied him. I’d say the best part here is that a woman got this tattoo in a fairly intimate spot — God bless the guy who discovers the tattoo, instantly understands it and proposes on the spot. Seriously. If you’re a single female reading this and you’re starting to feel the marriage bug, get a semi-obscure Simpsons tattoo and you will have guys fighting for you. Sure, some will be Kirk van Houtens… but you’ll also get more than enough Chad Sexingtons to compensate. 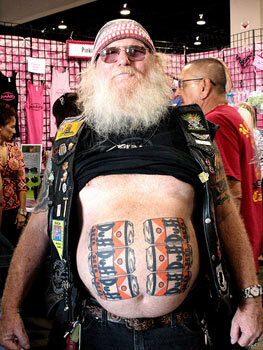 It’s a massive tattoo that looks like it was unbelievably painful — but I admire this guy for not half-assing it. (Also, as regular readers might remember, I ranked The Shinning as the best Treehouse of Horror story ever… and that quote is one of the best quotes in Simpsons history… so I love the decision.) 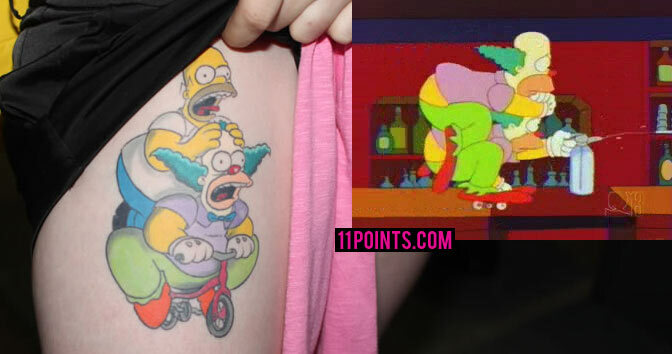 It’s a hell of a lot better than getting a tattoo of Krusty’s Golem. I would’ve guessed that, if someone endeavored to get a Simpsons knuckle tattoo, they’d go with Sideshow Bob’s “luv” and “hat” (with a bar over the ‘a’)… but these are pretty damn good too. Matsumura Fishworks and Tamaribuchi Heavy Manufacturing Concern would be proud. 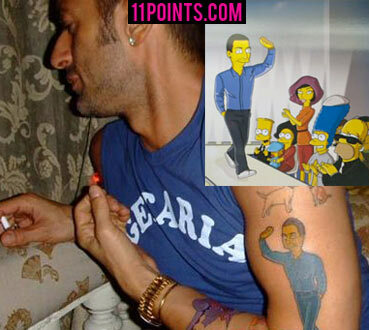 OK, so Marc Jacobs got himself as a Simpsons character tattooed on his arm. And I want to hate the guy for it, but I can’t. If I was turned into a Simpsons character (and not in Simpsonize Me fashion, but actually drawn by the team), I can guarantee I’d prominently splash that drawing around forever too. I love this one because it’s such an indirect Simpsons reference. 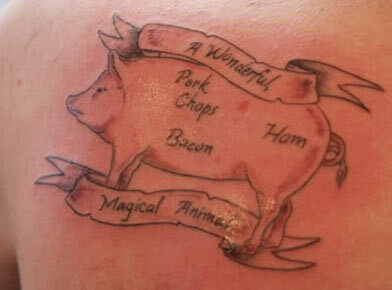 From the episode where Lisa becomes a vegetarian (which might be a top 11 episode if not for the surprisingly flat scene with Lisa, Apu and Paul McCartney at the Kwik-E-Mart’s secret garden), Homer can’t believe that ham, pork chops and bacon could all come from the same “wonderful, magical animal.” It’s a great tattoo from an episode that could’ve inspired many other great tattoos — the food chain, Bovine University, the flying pig, or, for someone going for a monster tattoo, the “you don’t make friends with salad” conga line. This is one of only two tattoos on this list inspired by tattoos that characters had on the show. 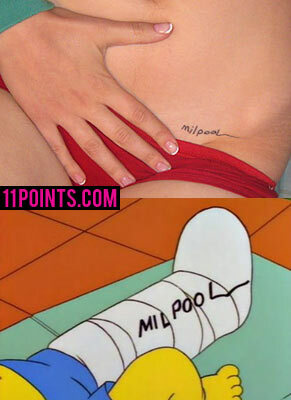 (I can’t believe no one followed Homer’s lead and got a Starland Vocal Band tattoo, by the way.) 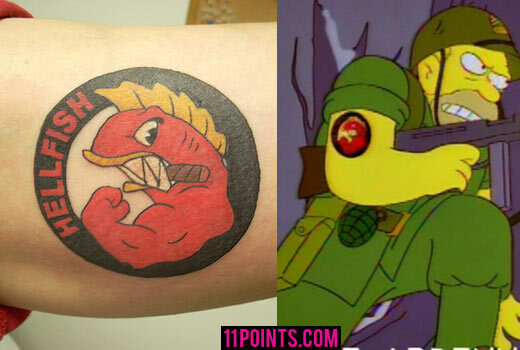 Grandpa’s World War Two unit, the Fighting Hellfish, had a great logo — and I found at least a dozen people who decided to get it tattooed themselves. 11 | And all I’ve done is enter my name!